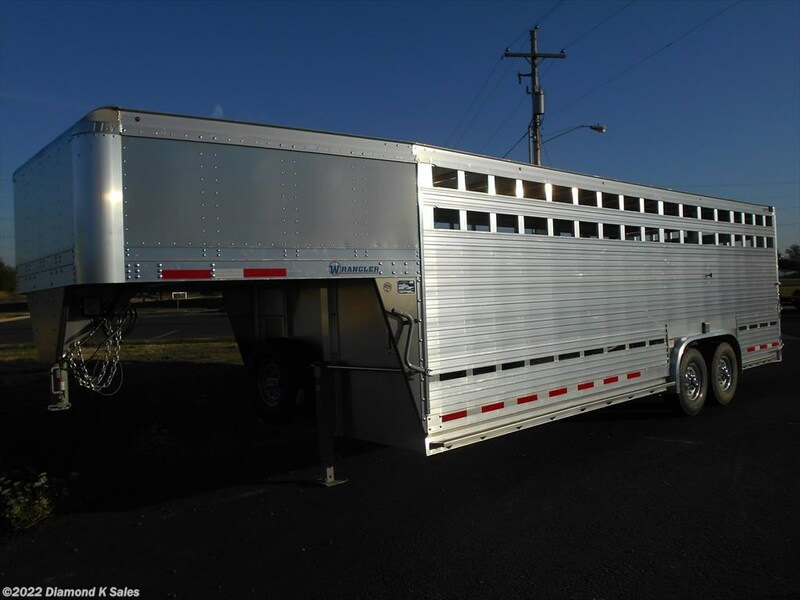 The industry's only "commercial grade" production model livestock trailer. 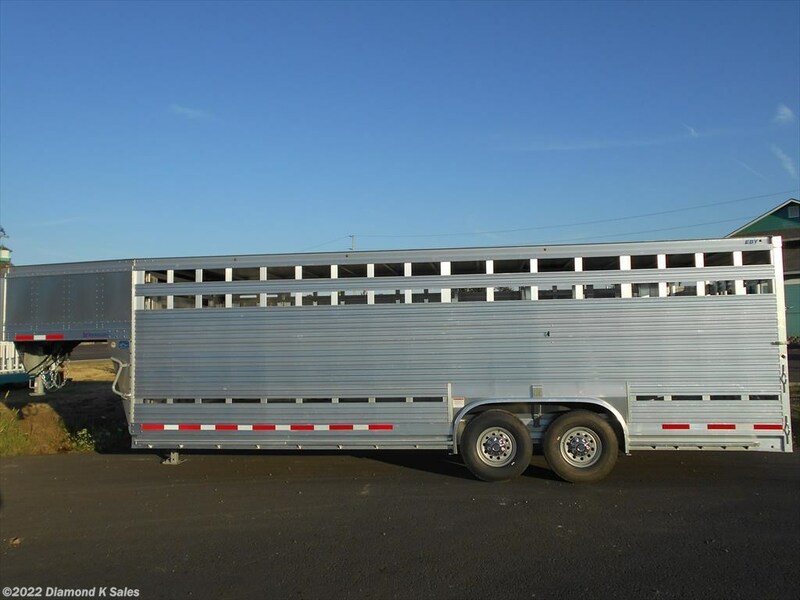 - Tires: (4) ST235/85R16 steel belted radials, load range E.
- Brakes: 12" x 2" electric on 7K Axles. - Safety Equip. : Two chains and electronic breakaway kit. - Front Nose Assembly: 9º tapered nose with .080 aluminum smooth sheet sides and front, with aerodynamic aluminum corner caps and extruded front corner posts. - Posts: 4-1/2" extruded aluminum hat shaped posts. - Crossmembers: 3" extruded aluminum I-beams on 12" centers. - Floor: 1/8" aluminum smooth sheet. - Lower Coupler: 2-5/16" ball coupler (20,000# ball rating) (30,000# ball rating on tri-axle) with steel hitch post section and aluminum front gusset, adjustable height 28" – 36-1/2" from ground to top of ball. 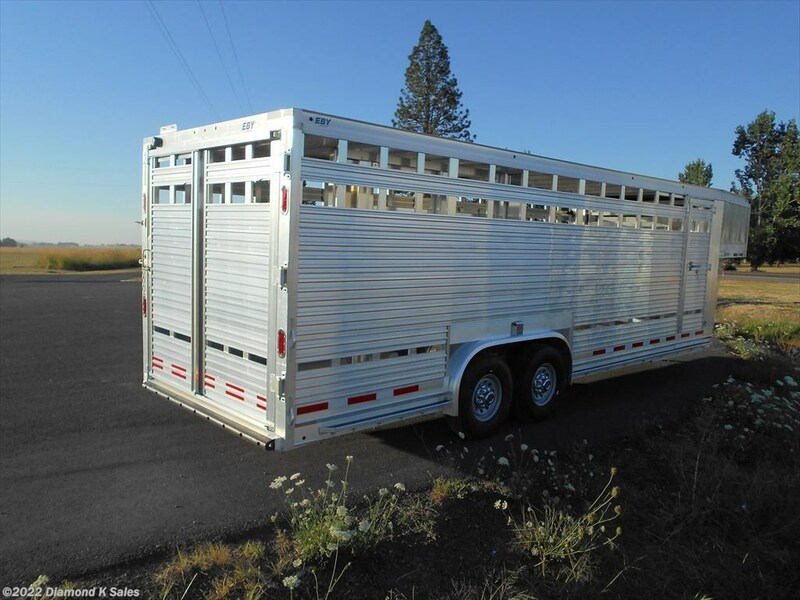 - Posts: Extruded aluminum, 1" x 3" tapered tubular side posts, spaced on 18" centers maximum. - Bottom Rails: 12" extruded aluminum. - Top Rails: 6" extruded aluminum. - Crossmembers: 3" extruded aluminum I-beams on 12" centers with 3" extruded aluminum J-beams at floor seams. 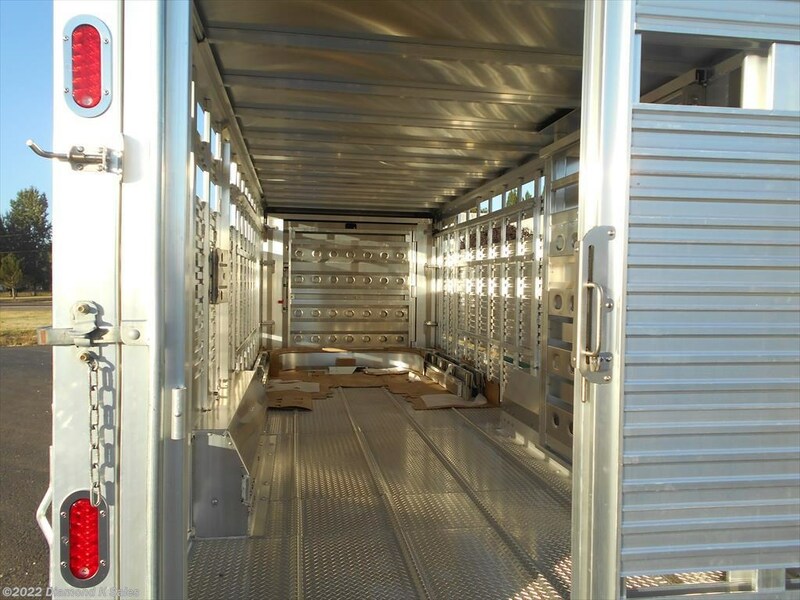 - Floor: .115 6061 T6 aluminum diamond plate with (4) 1" high ridges, corrugated longitudinally on 19" centers. - Side Door: 33" wide, curb side, 10-3/4" from drop sheet up to 26'models. - Rear Frame Assembly: 3" x 5" tubular extruded aluminum with Eby cast aluminum corner caps. 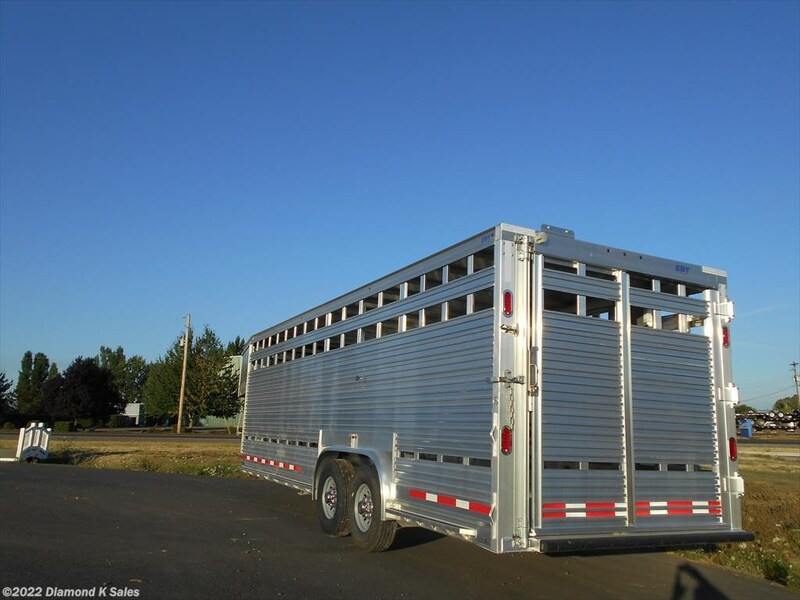 - Rear Door: Full swing with (3) 4" extruded aluminum offset hinges for extended swing radius. 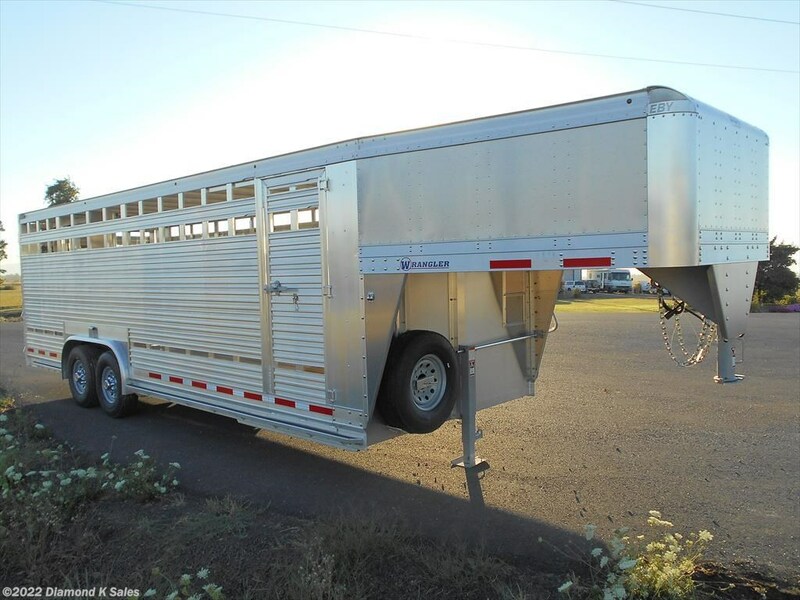 Hinges are mechanically fastened and welded to rear frame. 32" wide exterior sliding door on roadside with polyurethane rollers at the top and UHMW wear pads at the threshold. - Sheet: One-piece .040 aluminum externally riveted to top rail on 4" centers. - Bows: Arched, hat shaped 1-1/2" x 4" extruded aluminum on 24" centers. -Std. 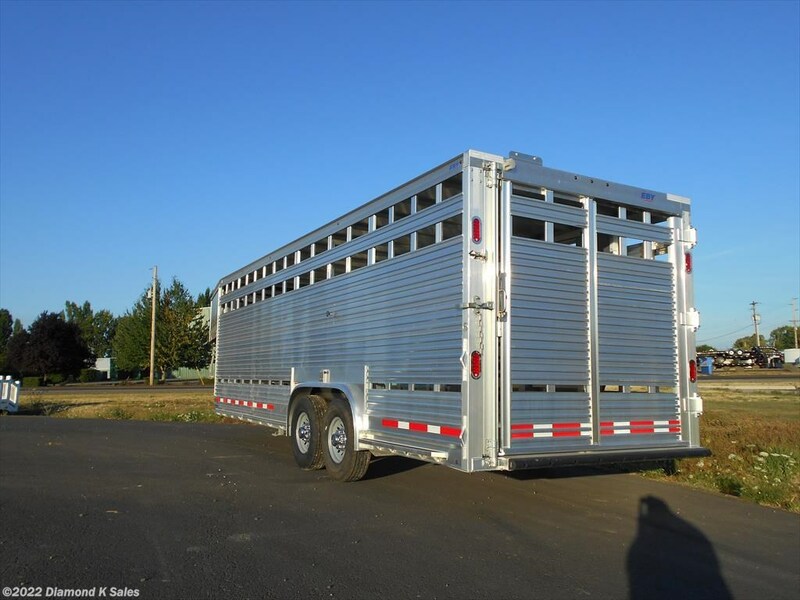 Partition: Extruded aluminum tube and punched sheet construction with (2) horizontal stiffener rails and outside release slam latch. Extruded aluminum pipe hinge with nylon bushing mounted curbside. Partition located on post aprox. 10’ from rear. w/slide door in it. Second center gate is mounted on rollers and adjustable. 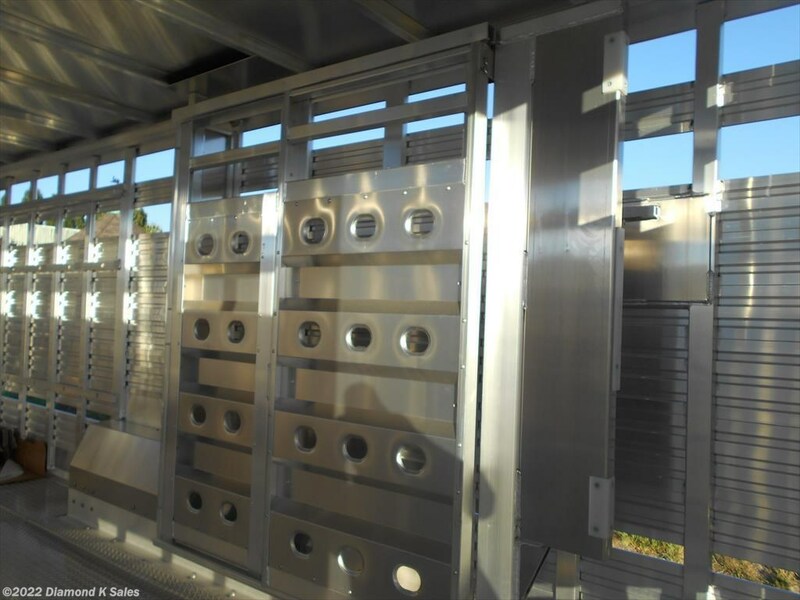 - Nose Partition: Bottom hinged, punched sheet construction with (2) self-catching rotary latches. - Lights: 12-volt D.O.T. approved, LED. - Wiring: A.T.A. color coded, wiring harness. - Rear Lights: Modular, turn-tail-stop, LED. One light each side (red). - Inside Lights: Two LED, with external rear water resistant switch. - Tire Carrier: Aluminum, mounted on exterior drop sheet. - Fenders: Extruded rolled aluminum. - Bumpers: Full width 3" molded rubber. - Skid Plates: (3) 3/16" formed aluminum. - Paint: Steel parts painted silver. 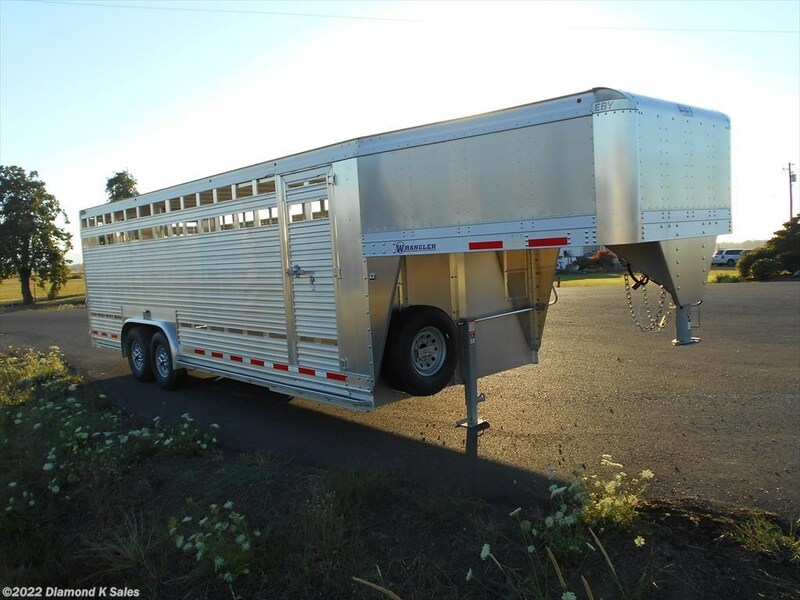 Livestock Trailer - 2019 EBY 6'11" X 24' X 6'6"
Livestock Trailer - 2019 EBY 6'6" X 16' X 6'6"
Livestock Trailer - 2019 EBY 6'11 X 16' X 6'6"
Livestock Trailer - 2019 EBY GN1MV 6'11" X 20' X 6'6"
Livestock Trailer - 2019 EBY 7'3" X 24' X 6'6"